Give your Products/ Services the Needed Attention by Giving your Brand First Page of Exposure across Major Search Engines. Pay Per Click is the most dominant and effective way to get your products or services chosen by your potential audience. We provide a wide range of Pay Per Click Services including Video Advertising, Paid Search Ads, Display Ads, Social Advertising and PPC Remarketing to get the most out of your Online Marketing. Our digital marketing team consistently research and monitor bid prices of the keywords or phrases relevant to your business group and regularly restructure your pay per click campaigns to help your business get the maximum ROI. 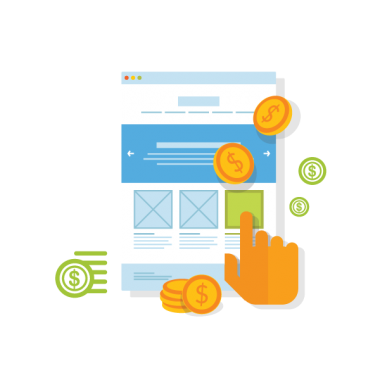 To help your business achieve goals and objectives in a quicker and in a cost-effective manner, we specifically implement complex yet tailored approaches for Pay Per Click advertising that includes prioritized list of activities to be sketched out for your business. Where organic or natural search marketing takes time, we activate paid search campaigns to earn visits and leads for our client’s business. Our team implement an effective digital strategy – PPC Remarketing to engage users (run targeted ads) who had shown interests in your product or service. Keep your Brand Reputation Consistent! We embrace social media platforms to create an interest for your products and services while reaching out to the targeted audience. We also provide display campaigns on various media networks as a backbone to expand your brand exposure amidst your business competitors. Our team efficiently manages brand awareness and direct response campaigns to increase the amount of leads you get. In today's multimedia-heavy web environment, video advertising is growing faster across mediums. To create a huge impact, we craft powerful video campaigns to target your ideal audience. Our expertise in SEO helped us to deliver comprehensive portfolio of services that helped to maximize the potentiality of our client’s web platform. We had a good collaboration with Seomakers! They are very knowledgeable of SEO trends, and our sites are progressing regularly in search engines. We have worked with the Seomakers agency for various projects and are very satisfied with their work. They find smart solutions for every issue pertaining to the project. A true partner for SEO and web services! Accompanied us in handling functional issues pertaining to our website in addition to SEO.